As a bench jeweler, I can’t tell you how many times I was asked to make a ring as a gift when the customer did not have any idea of the ring size. I had to break it to him that, in my experience, the size of her fingers has no relation whatsoever to her height, weight or dress size. And which of her 8 fingers and two thumbs are we guessing at? We would need to figure out her ring size another way. In the interest of secrecy, that can be a tall order without giving away a surprise. This is why jewelers will often offer one free ring sizing with the purchase of a brand new ring within a certain time period from the purchase date. However, it can be a fun challenge to try to find ways to get a ring size without the giftee finding out. One way is to check their jewelry box for a ring you know that fits already. Trace the inside of it and give that to the jeweler to compare to the inside diameter of a ring sizer. Or find some reason to have them try on one of your rings…just for fun. Make a note of if it was large or small and take that to the jeweler to be measured. Take your friend to a jeweler and pretend that you are ring shopping and have them get their fingers sized as well…just for fun. This is never a bad idea anyway because you can also get a feel for the kind of ring they might like. A thin little stacker for someone who like honking huge cocktail rings may end up as a disappointing gift. 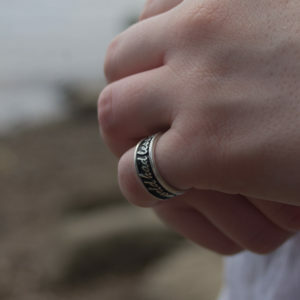 Customized with nearly any phrase, alphabet or symbol, these rings are available in sterling silver and 14K yellow gold. The lettering is raised embossed from the surface and the background is oxidized for contrast. Any jeweler who creates and sizes rings will keep a ring sizer set handy. This is the most accurate way to measure your ring size. It is a series of rings marked with the number size and a dash or mark to indicate the half sizes in between. It is important for a ring to slide over your knuckle and fit well enough that it won’t rotate in place on the finger. Sometimes that means it is tight over the knuckle. The best time to check your ring size is in the middle of the day as sometimes fingers swell in the morning or evening depending on factors like the weather and humidity. And of course if there is not jeweler handy, what do you do? Fortunately, we here at Fair Winds Jewelry offer our own Ring sizing guide in a FWJ Ring sizing tool!. Just follow the directions to print it out and use it to figure out your ring size. Your result will not necessarily be as accurate as an in-person ring sizing at a local jeweler, but a much better alternative than guessing according to your height and dress size. CLICK HERE to get your own ring sizing guide! Join the Voyagers Club for Exclusive Specials!